The design is holistic—suited to the everyday needs of farmers. But, as aftershocks continue to shake Nepal, confidence in traditional building materials—stone, wood, bamboo, earth—and vernacular architecture is eroding due to opinions that identify the architecture of Nepal’s Hills as a reason for the massive loss of life and property following the April 25th earthquake. Before homes in the Hills are replaced by pre-fabricated housing or one-story concrete bunkers in the name of “building back better,” we should consider whether the weakness in the structures which fell during earthquakes and aftershocks is due to design and materials or to the techniques used to build them? And if so, how techniques can be improved to recreate familiar village-scapes in earthquake-affected areas? Some solutions are held in the local knowledge of carpenters and masons. Prior to wood becoming a scarce commodity in the Hills during the 1970s and 1980s, homes were constructed with alternating layers of stone blocks and wooden beams joined together at the corners to create a “box effect.” The seamless construction allowed for the structure to move as a single entity, a “box,” strengthening the structure and enabling it to withstand the motions of earthquakes. As the types of wood preferred in home construction became expensive and less available, the wooden bands framing the home (in Nepali, the nas or nerves of the structure) were abandoned. The practice of sur milaune, of making a rhythm for the home through the construction of cornerstones, has also been increasingly left behind in recent construction along with concept of chukul or stitching walls with the wooden bands. hese techniques, once indispensible to Nepal’s vernacular architecture and which make the buildings earthquake resistant, are known to carpenters and masons in the Hills and can be revived as favored building practices in the reconstruction of homes and villages. In last 40 years, due to professional, academic and government neglect, Nepal vernacular architectural traditional was not able to move to modern era. Similarly given the high cost of wood, we taught people how to treat bamboo so they can use it for beams and rafter. 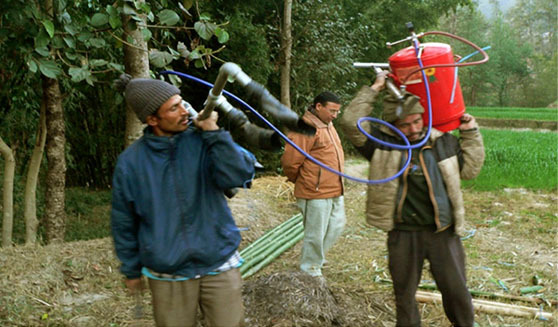 The treatment system has now become so streamlined that the Government of Bhutan has installed them in community forests across the country. Small interventions like treating bamboo or adding natural additives to the clay can have significant social and environmental impacts. 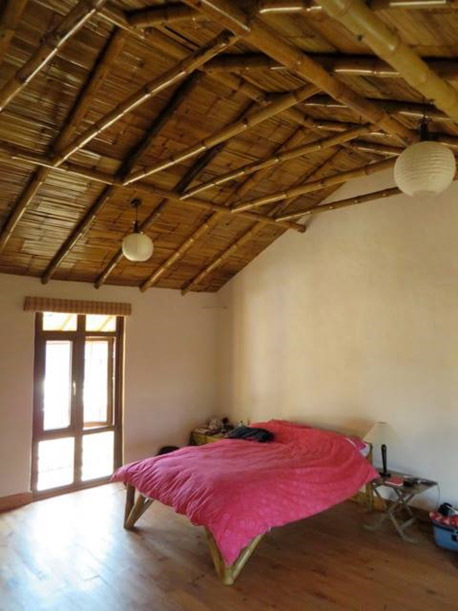 Bamboo roof or earthen walls, which was only reserved for making cow sheds or rural homes are now being used in high-end hotels and spas. Stone and Bamboo School built by Abari and Learning Planet that survived the earthquake in Gorkha. Nepal has enough local knowledge and technologies to construct homes suited to their livelihoods and appropriate to an earthquake-prone environment. The earthquake can be a great opportunity to enhance skills of the people, so they can build their own homes that are not only hazard resistant but also more comfortable and suited to contemporary context.